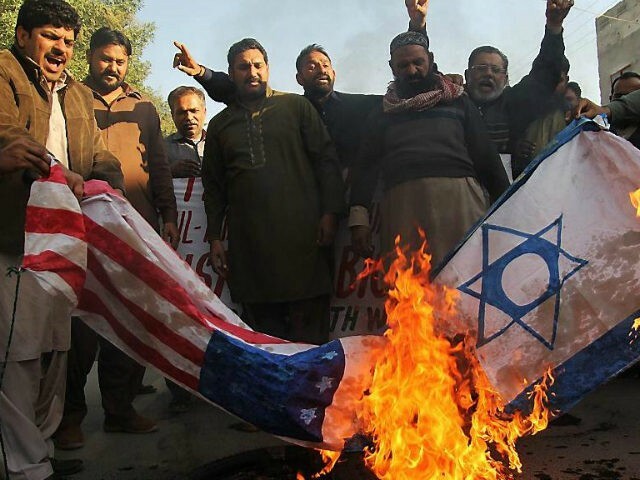 "The terrorist-linked Muslim Brotherhood (MB), echoing other jihadist groups, has pledged to “shed blood” and “wage war” against the United States after President Donald Trump officially recognized Jerusalem as the capital of Israel and directed his government to move the American embassy to the city." One of Rome's favorite prophecies has to be the so called seven year peace treaty wherein they claim will be broken by the little horn in the middle of the seven years who will then desecrate the sanctuary and wreak havoc for the remaining three and a half years. The Jesuits not only invented that folderol, they also twisted the prophecy that obedient students of the Bible refer to as the "week of Daniel" to hide the truth about the Popes. The prophet Daniel outlined the exact year that Jesus stepped into the river Jordan (27AD) to be baptized of John; the exact year He would be crucified for our sins; (31AD) and the exact year the apostles would begin preaching unto the Gentiles which was also the exact year the Jews stoned Stephen and the Christians replaced the Jews as the nation our God now calls Israel. (34AD) If you saw my "Who is Israel" page and or videos you would know exactly what I mean here. If you have seen that page, you would also do well to view a new section I placed on that page to answer numerous questions regarding replacement theology wherein I show the biblical and prophetic proof that replacement theology is truth in its purest form. Just as Rome changed the Sabbath to Sunday so as to move many to wonder after that beast as we see is apparent in the many Sunday keeping churches, the lukewarm pastors were unable to understand the prophecies of Daniel were changed by the Jesuits and taken out of chronological order by placing the week of Daniel at the end of the world instead of leaving it inside the 2300 year prophecy where it was to glorify Christ's prophesied mission for all of mankind. Rome's main objective in moving it was to hide the fact the great tribulation was caused by the Popes during the Inquisition. But thanks to all the Sunday keeping pastors who were unable to see how Rome twisted the prophecies, who by now became their teachers in the Vatican controlled Seminaries. It was also prophesied in the Word of God that you cannot understand prophecy unless you obey the God that wrote it, and because all those pastors refused to keep God's law, they were easily confused by the Jesuits and then went forth to teach all the world to wonder after the beast in doctrine as well as false prophecies. With all that said, what's to stop this from happening next. The basic reality is this.. there is no prophecy in the Bible about a seven year tribulation and or even a seven year peace treaty. It is only found in Vatican writings that have been penned by Jesuits under direct inspiration of Satan to protect the Popes. But, and seeing how this is not a prophetic utterance and therefore based only on the desires of the man of sin in Rome, if he is allowed to go ahead on this, watch in the coming days, months or years to see if the Vatican and their political cohorts actually suggest a seven year peace treaty with the nations now promising to "shed blood" and "wage war" due to the embassy moving. And if they do that, watch also how they will plan on breaking that treaty in three and a half years just to make their agenda appear prophesied. Especially now that it was announced just this morning that the UN is planning to give $65 million to help the Palestinians fight Israel on this in the courts. Again, none of this folderol is prophesied. It's all Vatican lies. But it has been an agenda the Vatican has pushed strongly ever since they moved Jesuit trained Cyrus Scofield to place this demon inspired seven year trib theory in his bible commentary on Daniel 9:27 in the Scofield Reference Bible notes of 1909. Trump’s Jerusalem declaration sparks talk of 3rd Temple → ← Image of the beast is ALIVE!